When historians discuss ancient Egypt, they often talk about how the pharaohs lived. Thanks to excavations at places like Deir el Medina, however, we know some things about the ancient Egyptian middle class. Deir el Medina was a village that housed craftsmen who worked on New Kingdom tombs of the Egyptian upper classes. Architects, carpenters, and other workers lived in this village with their families near the Valley of the Kings. Necropolis workmen’s village, Deir el Medina. Photo by Roland Unger. Houses in the village were made of adobe brick. The houses stayed cool because windows were built into small rectangles and were high up on the walls to keep out direct sunlight. Doors were made of wood, and some could be locked from the inside. A would-be thief could easily break the fragile locks, but most workers in ancient Egypt had few goods to steal. If you could walk into one of the workers’ homes, you would enter the hall first. This was a place where visitors were welcomed. You might compliment the lady of the house on the colorful drawings and shapes painted on the walls. This room would also have an altar to Bes, the goddess who protected families. If your guest invited you to come farther into the home, you would enter the family space. This was the central room of the house where family members gathered each day. Most ancient Egyptians couldn’t afford furniture, though some of the workers’ families may have had wooden tables or stools in their family rooms. The room also had long benches built into the walls which were used as sofas or beds. Mats used for sleeping might also be in this room. The house also had a basement for food storage, though guests probably didn’t go in there often. In the back of the house was the kitchen. In ancient Egypt, this was one of the most important and busiest rooms. Here you would find a built-in clay oven and spaces for cooking utensils. Some ancient Egyptians even had a primitive refrigerator. They placed pottery filled with beverages in a pit deep in the ground. A tiny roof was placed over it to keep the drinks cool. Since the most common ancient Egyptian drink was beer, your guest would likely offer you one from his pit on a hot day. Privacy was an unknown concept for the ancient Egyptian middle class. Their houses were small and usually only one story. Kids and adults didn’t have separate bedrooms. Ancient Egyptians also lived very close to their neighbors. There were no “backyards” because the next home was just feet away. Before the name ISIS (an acronym for Islamic State of Iraq and Syria) became synonymous with public executions and terror, a goddess with the name Isis was popular in ancient Egypt. The ancient Egyptian goddess Isis represented many positive values, such as protection, healing, and the importance of family. Clearly, she had nothing in common with the ISIS we read and hear about today. According to ancient Egyptian mythology, Isis was the wife and sister of the god Osiris. Osiris ruled Egypt, and Isis supported his endeavors. Unfortunately for the couple, Osiris’ brother Seth wanted his brother’s power so badly that he murdered and then dismembered Osiris. Isis and her sister Nephthys mourned Osiris, but they did not sit around crying for long. Instead, the two women travelled to the ends of the earth to find Osiris’ remains and revive him: “Rise up, Osiris, for Isis has your arm and Nephthys your hand.” After Osiris’ resurrection, Isis conceived a son with him whom she named Horus. Osiris left Isis to care for their son and became the god of the underworld. Osiris and Winged Isis, Isis Temple, Philae Island, Egypt. Photo by Remin. Proving that a woman’s work is never done, Isis now had to hide her son from the evil Seth. She proved to be a wonderful and protective mother. For example, she healed Horus when a scorpion stung him. Isis continued to watch over her son until he was old enough to fight Seth. Horus successfully avenged his father’s death and became king of Egypt, but he couldn’t have done it without his mother. Ancient Egyptians associated Isis with motherhood, especially as the mother of Egyptian kings. Early Pyramid Texts state “the king drinks milk from his mother Isis.” At first the goddess could only be called upon to help Egyptian pharaohs, but later the nobility and even commoners could ask Isis for assistance. In a time with high mortality rates, ancient Egyptian mothers often recited spells that included the goddess in the hope that Isis would heal their sick children. 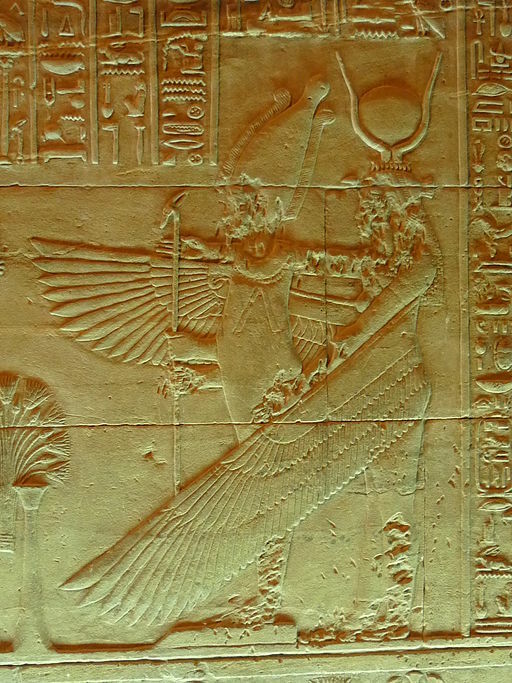 In addition to her role as a mother, Isis also served as the protector of the dead in the afterlife. She was often depicted on the sides of royal coffins with winged arms. With the wings of the goddess to carry their deceased loved ones to next world, Egyptians felt comforted even though they mourned the dead. A faithful wife, loving mother, a healer of children, and a comforting presence to those who mourn—all qualities that the ancient Egyptians gave to their Isis. Unfortunately, the organization that now uses her name stands for none of these admirable traits. If you celebrate Easter, you’re probably planning to dye Easter eggs this month. But do you know how the egg became a symbol of Easter? the universe. People in ancient Persia, Greece, and China gave each other gifts of eggs during spring festivals to celebrate the new growing season. Since people did not always write things down in ancient times, we can’t know for certain whether the idea of Easter egg came from an older civilization. Supposedly eggs were dyed and eaten at the ancient spring festivals. The first record of the term Easter egg didn’t show up in Western European books until the fifteenth century. Some historians believe that missionaries living in Persia or Greece brought the tradition of coloring eggs to the West. During the Middle Ages, no one ate meat during the winter. The people were both trying to conserve food and observe the custom of fasting for Lent. In addition to giving up meat, they also didn’t eat eggs. Instead, they saved their eggs and brought them in baskets to church, where a priest blessed the eggs. When the Easter holiday arrived, people were allowed to eat eggs again. This was considered such a treat that eggs were given as presents. Children sometimes received an egg for Easter from their parents, or they went from house to house begging for eggs like America’s trick-or-treaters on Halloween. Decorating Easter eggs became an art, especially in Eastern Europe. Many of the eggs were dyed red to symbolize the blood of Christ, but other colors such as yellow appeared, too. 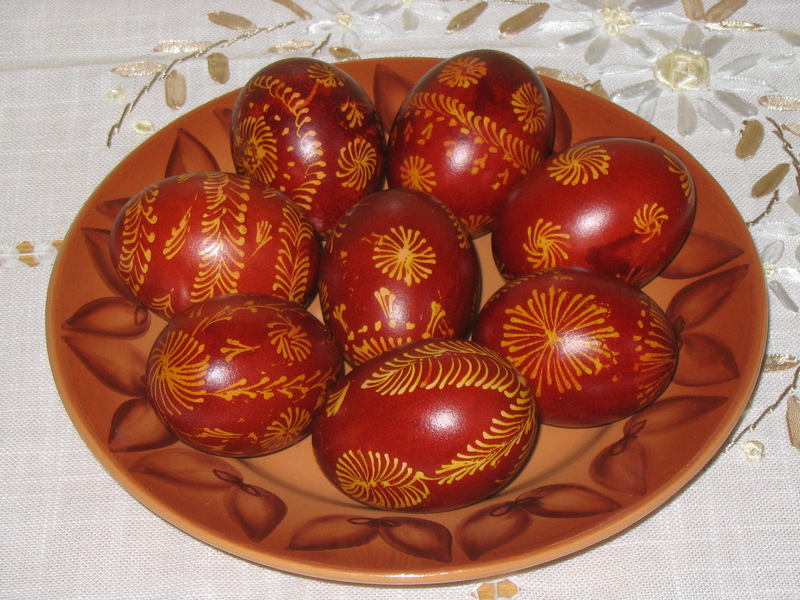 In Poland and Russia, girls made elaborate designs on their Easter eggs. Some popular symbols included a sun for good luck, a deer for good health, and flowers for love and beauty. Other eggs had crisscrossed lines or checkerboard patterns. Immigrants from Europe brought the art of decorating Easter eggs with them when they settled in America. Games involving Eater eggs that were popular hundreds of years ago are still played today. One games is the Easter egg roll. In this game, the goal is to roll as many eggs as possible without cracking the shells. The White House in Washington, D.C. hosts an annual Easter Egg Roll. The game was discontinued in 1878 because of the wear and tear on the Capital lawn, but started again during the presidency of Rutherford Hayes. Hayes’ wife allowed the children to use the White House lawn. With the exception of the Civil and World Wars when the game was not held, the White House Egg Roll became a tradition that remains to this day. Maybe you have a pet at home, but did you know that the ancient Egyptians also had pets? Some of their pets were similar to those we have today, while others now live in the wild or in zoos. Like families today, many ancient Egyptian families had a dog. Most ancient Egyptians owned mutts, but some of their dogs resemble breeds that still exist. On the walls of tombs, wealthier Egyptians sometimes included likenesses of their pets. Some of the dogs seen in tomb reliefs include a breed similar in size and shape to the greyhound, as well as a dog that resembled the dachshund. Ancient Egyptians named their dogs. In English, some of the names translate to “Ebony” or “Good Watcher.” One pharaoh’s dog was named “Cook-pot” because of the dog’s love of food! Dogs provided loyal companionship and performed useful work like hunting and guarding. Owners with close bonds to their dogs had their bodies mummified after the pets died. The ancient Egyptians believed that by preserving the body of their beloved animal, it could join its owner in the afterlife. Not all ancient Egyptians liked dogs, however. A dog’s loyalty and obedience was considered a sign of weakness. Cats got respect because they didn’t depend on humans like dogs did and they were more likely to ignore their owners. Like dogs, cats had multiple functions in ancient households. They served as pets but also kept mice and snakes away. Cats were most often portrayed in the tombs of women, though at least one Egyptian prince had a fondness for his cat, which he named “Miss Kitty.” In fact, the prince loved his pet so much that he commissioned an elaborate sarcophagus when she died. The images on the sides of the coffin showed Miss Kitty making offerings to the Egyptian gods. Contrary to what some early historians believed, ancient Egyptians did not worship their pet cats. Some goddesses could take the shape of a cat, however. The goddess Bast, for example, had the head of a cat. Her cult became especially popular in during ancient Egypt’s decline. At Bast’s shrine, cats roamed freely. Though they were not as common as cats and dogs, monkeys also became pets in ancient Egypt. Pictures in tombs show monkeys swinging from chairs and playing with children. On occasion, a monkey sat by his owner’s chair, but it’s doubtful that these creatures stayed still for long. Despite their mischievous nature, one pharaoh felt so attached to his pet monkeys that he mummified five of them so he would see them in the next life. This post is not a complete list of pets of the ancient Egyptians. Some households also had geese as well as younger versions of larger animals such as gazelles. Young children probably played with a wide variety of baby animals until the animals got too large for them to handle. decided to extend his empire to the East and took forces with him to Egypt. In the process of digging a fort near the town of Rosetta, one of his soldiers found a strangely shaped black slab, which was inscribed with three different types of writing. The top, though damaged, contained Egyptian hieroglyphics; the center section was written in demotic, a form of shorthand writing of the Egyptian language; the lower part revealed Greek letters. Until this discovery, almost nothing was known about the language of the ancient Egyptians. Ancient Greek was still familiar to scholars, however. The Greek part of the stone stated that the three sections of writing all said the same thing—they were descriptions of the decree issued by priests at Memphis on March 27, 196 BC to honor the anniversary of King Ptolemy V Epiphanes’ reign. 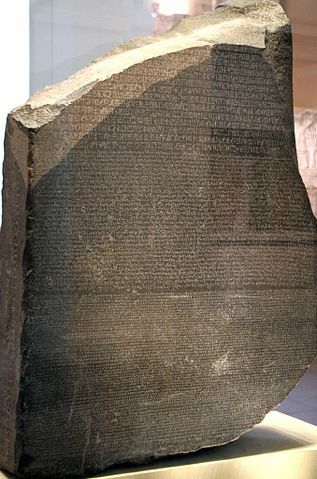 The British took possession of the Rosetta Stone in 1801 when they defeated Napoleon. Copies of the stone’s inscriptions were made and scholars all over Europe scrambled to be the first to solve the riddle of the hieroglyphics. A breakthrough came when Thomas Young of England determined that at least some of the hieroglyphics represented letters of the ancient Egyptian alphabet. They were not purely a crude form of picture writing—for example, a hieroglyph that was shaped like a bird did not always refer to an actual bird. He identified the names of more than one Egyptian ruler in hieroglyphics. Building on Young’s work, French Egyptologist Jean-Francois Champollion deciphered the hieroglyphics. He explained his findings in A Summary of the Hieroglyphic System of the Ancient Egyptians: “Hieroglyphic writing is a complex system, a script simultaneously figurative, symbolic and phonetic, in one and the same text in one and the same sentence, and I should say, almost one in the same word.” Some hieroglyphics represented letters of the Egyptian alphabet; some combined groups of sounds (for example, one hieroglyph represented letters that were commonly used together to save space), and some were added as pictures to clarify the meaning of a word. Once the Rosetta Stone’s inscriptions were translated, scholars could learn more about the ancient Egyptians, their culture, daily lives, and religion. Since 1802, it has been displayed in the British Museum in London, though Egyptian archeologists are trying to bring the stone back to Egypt. The religious titles and duties held by ancient Egyptian women seemed to give them status in their society. Yet many religious duties were closed to women. Except in extreme cases of emergency and one takeover by female pharaoh Hatchepsut, pharaohs were always male; this had important consequences for religious Egyptian women. The pharaoh stood atop the Egyptian hierarchy in government as well as religion. Since the pharaoh was considered half god and half man, he functioned as an intermediary between the gods and the people and he was also the only official priest of all the gods. Women could never aspire to the rank of chief priest, but they held other respected positions such as priestess. Although large numbers of women in the Old and Middle Kingdoms served as priestesses of the goddess Hathor, their role remained limited. For example, priestesses carried out rituals and feasts, but unlike male priests, did not hold administrative positions. The priestesses were the wives of important officials—mayors, senior civil servants—positions only held by men. Ultimately, priestesses owed their position not to their abilities or religious faith, but to their husbands. Another title women held in ancient Egyptian religion was God’s Wife of Amen, the main god of the ancient Egyptians. New Kingdom queens did not tend to serve as priestesses but they often held the title of God’s Wife of Amen. By the beginning of the New Kingdom, the title was handed down to kings’ daughters. In contrast to the priestesses of the Old and Middle Kingdoms, the God’s Wife of Amen wielded considerable power. On the one hand, she occupied a respected religious position. Her power is described from a scene in one of Pharaoh Hatshepsut’s chapels: “She [the God’s Wife of Amun] is shown leading a group of male priests to the sacred lake of the temple for the ritual purification before entering the temple courts. They then proceeded to the sanctuary of the god where Hatshepsut as king performed the ceremonies in front of Amun with the god’s wife of Amun in attendance.” The God’s Wife of Amun was clearly the most powerful female religious figure at that time, since it was very unusual for a woman to lead male priests in their rituals and even more unusual for a woman to enter the inner sanctuary of a god. On the other hand, the God’s Wife of Amen also occupied an administrative position. For example, she controlled acres of land. Despite her privileges, the role of God’s Wife of Amen was limited—women could only acquire it by being a king’s daughter. In addition to the titles of priestess and God’s Wife of Amen, ancient Egyptian women also became professional mourners and songstresses. The profession of mourner was open only to women. They were hired to express grief at funerals by beating their breasts, tearing at their hair and wailing. The fact that this position was reserved for women suggests that only women were capable of this kind of excessive grief which would be incompatible with the man’s role in Egyptian society. Women of high birth had another option in religious life of the New Kingdom—they could become songstresses. This office gave considerable respect to its bearer. The title shemayet or chantress was the most common one for elite women in the New Kingdom. For example, every woman of status at Thebes was a “chantress of Amen.” This was not a position that any woman could acquire without a wealthy husband. The job of the songstresses was to please the gods and goddesses and to communicate with them but not much is known about their duties. Considering the positions of priestess, God’s Wife of Amen, and professional mourners, the temple songstresses probably had no more authority in this male-dominated society than they did. Egyptian goddesses portrayed women’s passive role in the community. Each goddess, regardless of her popularity or the power she sometimes exerted, reinforced the Egyptian female ideal who bore children and obeyed her husband. One goddess who fit the description of the ideal woman was Isis. The myth of Isis says that when the god Seth betrayed her husband Osiris and tore him to pieces, Isis and sister Nephthys gathered his remains and made Osiris whole again. Isis conceived a son named Horus with the resurrected Osiris. As a mother and a wife, Isis was particularly important to women. Isis was frequently invoked to protect children because she used her magical powers to hide her newborn son Horus in the marsh away from the jealous Seth. Isis and Horus were also frequently called upon to ensure a safe delivery for a woman in labor. Prayers and spells such as “For speeding up the child-birth of Isis” could be recited during a difficult delivery. Clearly Isis must have possessed great magical powers to resurrect her husband and protect her child, yet she still conformed to the ancient Egyptian feminine ideal. Although occasionally less benevolent than Isis, the goddess Hathor also acted the part of the model Egyptian woman. Hathor was the goddess of love and music who was often depicted as a cow because of her role as a nurturer and provider. The importance of Hathor was emphasized by her identification with royalty. The pharaoh could be identified with many gods, but he was often referred to as the son of the sun-god Re. As his wife, the queen wore the sun disc and horns of Hathor, who was the daughter of Re. Though the queen was the woman most directly associated with Hathor, ordinary people could call on Hathor for protection. One mother invoked Hathor to be present at a birth: “Rejoicing, rejoicing in heaven, in heaven! Birth giving is accelerated! Come to me, Hathor, in my fine pavilion, in this happy hour.” Hathor’s powers, like those of Isis, were used to protect women. Although these powers were vast, they never directly impacted the male worlds of politics and war. The ancient Egyptians viewed many of their goddesses as potentially good as well as potentially evil. Hathor could be either benevolent or destructive. The popularity of the nurturing version of Hathor reflected society’s idealized woman, but the Egyptians realized that even the nurturing mother could become violent. Goddesses were not always cast in traditionally feminine roles. Hathor’s destructive counterpart was Sekhmet, the lion-headed goddess of war and sickness. When the god Re wished to destroy mankind he sent Sekhmet to carry out his wish. He later changed his mind but Sekhmet refused to stop, relishing the destruction she was causing. Re checked Sekhmet by getting her drunk and mankind was saved. Significantly, a male god stops Sekhmet’s plans, suggesting that regardless of her powers, no woman can override the wishes of a man.